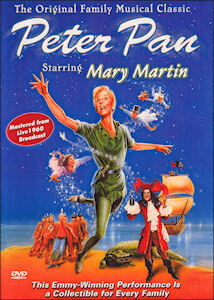 Peter Pan DVD (Region 1) 1960/TV. Color. Mary Martin, Cyril Ritchard, Lynn Fontanne. An entire generation of baby boomers grew up with this stagy but magical production, which originated on Broadway but was broadcast several times on TV. They may not know Mary Martin or Cyril Ritchard--two staples of the commercial theater in their time--for any other reason, but they'll always be able to name them as Peter Pan and Captain Hook. The story of the boy who wouldn't grow up includes a classic score with songs that can bring a tear of nostalgia to the eye of the middle-aged--like "I Won't Grow Up," "I've Gotta Crow," and "Neverland." The flying, the goofy comedy--it's all there in this DVD version of the classic TV broadcast. It's hard to know what sophisticated modern youngsters would make of it, but their parents will gladly sit and watch with them.